There are varying opinions about whether or not to take your puppy on a puppy course. Many people who have experience raising dogs for years think it is unnecessary. People with small breed puppies sometimes think that a puppy course is not suitable for their puppy. As a veterinarian, I would always advise people to take their puppy on a course. I will try to explain why. Why do you recommend going on a puppy course? No matter how many dogs you've had, every dog is different and we all have questions on how best to handle certain situations. A puppy course is usually fun for you and your puppy. You will learn a number of basic skills in a playful way, including sitting, lying down, recall, walking without pulling, checking teeth, etc. You can share tips and experiences with other owners. It's great for socialising your puppy. On the course, your puppy often comes into contact with puppies of different dog breeds and gets to know the characteristics of these different breeds. You often learn to understand your puppy better, because you get an explanation about the basics of dog behaviour on the course. You are encouraged to get actively engaged in raising your puppy. You learn to be consistent in your behaviour towards your dog. A good instructor can often also recognise early behaviour that could lead to problems later in life and you will be able to address this before it becomes a problem. What are the reasons why some people do not go on a course? A puppy course takes time and energy, just like a hobby. You have to go to the sessions at a specific time each week and you will need to practice to get results. The way in which the course is taught might not correspond to how you want to interact with your dog. There is no course near you. Where can I follow a puppy course? If you go to The Kennel Club website, you can find an overview of the different dog schools that are associated with The Kennel Club. This gives you an overview for each town. There are also dog schools that are not associated with the Kennel Club. You can often ask your veterinarian where you can attend puppy training near you or which instructors are recommended. How do I know whether a puppy course is right for me? You and your puppy will only learn from a puppy course if its way of teaching suits you. There are courses that purely work with positive rewards. There are also courses that use rewards alongside clicker training. That is why we always advise you to go and look at various dog training schools and to inform about the contents of the course. Using a choke collar or prongs is completely outdated! 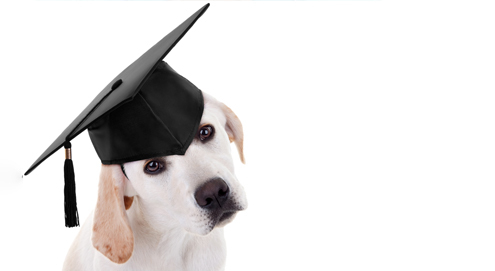 How much does a puppy course cost? The costs of a puppy course vary wildly from one dog school to the next, so be sure to ask about this when you are looking around. After the basic training course, there are various options for further training for you and your dog. Lots of dogs enjoy working with their owners in specific ways and a lot of owners choose to have a dog to practise sports. After the puppy course, you can choose a follow-up course for raising your dog. There is obedience training, where you take an exam to show that your dog can act responsibly in society. What's more, you can also train your dog to be a working dog or an assistance dog. You can find more information about the various sports in our article "Playing sports with your dog"
Go and check out a puppy course before booking it, to see if the course is right for you. Have lots of fun raising your puppy! View our range of Royal Canin puppy food online! Treat bag for storing doggy rewards. To train your dog's strength and balance. For house-training & pets that urinate in the house. Dog whistle with a high frequency. With a quieter click for puppies and dogs with sensitive hearing.